Venice is one of the most interesting and lovely cities in the world. This sanctuary on a lagoon is virtually the same as it was six hundred years ago, which adds to the fascinating character. Venice has decayed since its heyday and is heavily touristed (there are slightly more tourists than residents), but the romantic charm remains. Venice may not seem huge but it is. It is made of different boroughs. The most famous is the area comprising the 118 islands in the main districts that are called private://Sestieriprivate:// and they are: Cannaregio, Castello, Dorsoduro, San Polo, Santa Croce and San Marco, where the main monuments and sights are located. Clock tower (Torre dell'Orologio), (San Marco Square) — Having been closed for restoration for many years, the restored astronomical clock is now visible. Scuola grande di San Rocco — A masterpiece of Tintoretto, this guild house is an exquisite example of Manierist art in its best. Jewish Ghetto of Venice. 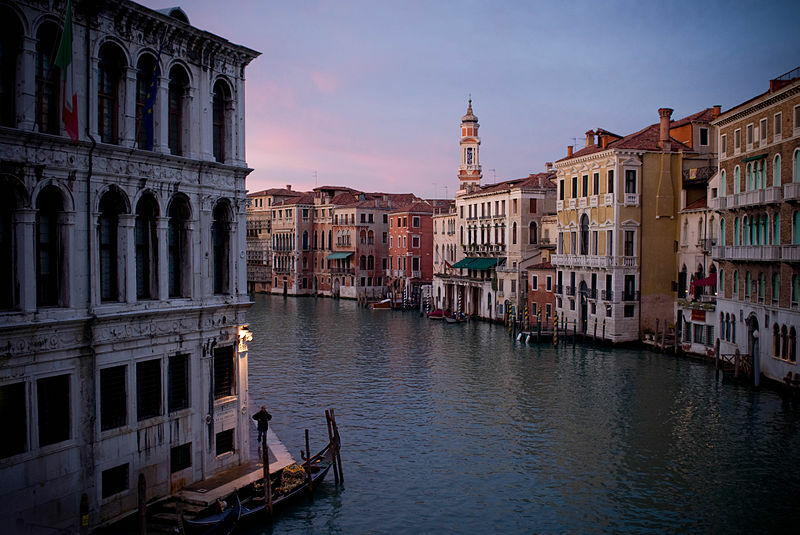 Venice's ghetto was the first private://ghettoprivate:// (coming from a Venetian word for the Iron Foundry that was on the site previously) and private://ghettoprivate:// eventually came to mean any neighborhood that was made up of a single ethnic/racial group. The Rialto market and the Rialto Bridge The Rialto market is for shoppers. To the east is a neighborhood of small shops and restaurants; to the west is the Rialto farmers' market. Zattere. It's a long and sunny walk along the Giudecca canal. The closest commercial airport is Marco Polo Airport. There is a city bus and a shuttle bus from Marco Polo to Piazzale Roma. Treviso Airport, located 25 km (16 mi) from Venice, is relatively small but becoming increasingly busy as the main destination for Ryanair, Wizzair, and Transavia budget flights. 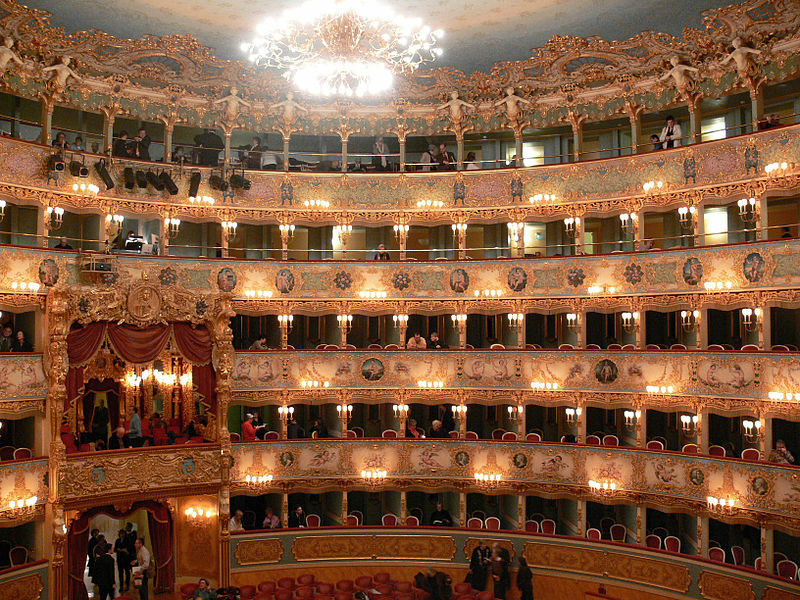 From Treviso Airport to Venice and Mestre, Barzi Bus Service offers a &€13 round-trip ticket price to Venice. These tickets are also available on their bus. Trains from the mainland run through Mestre to the Venezia Santa Lucia train station on the west side of Venice; make sure you don't get confused with Venezia Mestre which is the last stop on the mainland. Cars arrive on the far western edge of Venice, but remain parked at the entrance to the city (Piazzale Roma or Tronchetto - Europe's largest car park.) There are no roads past this point -- and never were, even before cars. Car parking is very very expensive here (26 €/12h, 30 €/24h) and the tailbacks can be quite large. 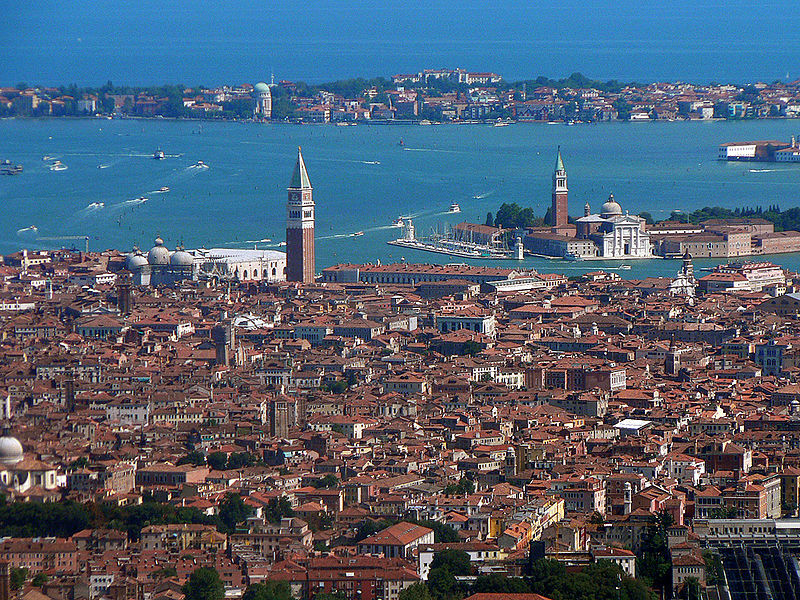 An alternative is to use the car parks on the mainland (terra ferma) and catch a train or bus or vaporetto into Venice. Park near the Mestre railway station, and catch a train to Venezia St.Lucia. Ships arrive at the Stazione Marittima which is at the west end of the main islands, it is served by vaporetti and water taxis.